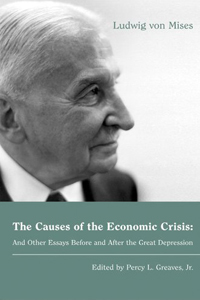 I chanced this morning on the superb collection of essays from Ludwig von Mises, The Causes of the Economic Crisis and Other Essays Before and After the Great Depression (PDF). Only the hopelessly confirmed statist can cherish the hope that a money, continually declining in value, may be maintained in use as money over the long run. That the German mark is still used as money today [January 1923] is due simply to the fact that the belief generally prevails that its progressive depreciation will soon stop, or perhaps even that its value per unit will once more improve. The moment that this opinion is recognized as untenable, the process of ousting paper notes from their position as money will begin. If the process can still be delayed somewhat, it can only denote another sudden shift of opinion as to the state of the mark’s future value. The phenomena described as frenzied purchases have given us some advance warning as to how the process will begin. It may be that we shall see it run its full course. Obviously the notes cannot be forced out of their position as the legal media of exchange, except by an act of law. Even if they become completely worthless, even if nothing at all could be purchased for a billion marks, obligations payable in marks could still be legally satisfied by the delivery of mark notes. This means simply that creditors, to whom marks are owed, are precisely those who will be hurt most by the collapse of the paper standard. As a result, it will become impossible to save the purchasing power of the mark from destruction. In discussing the situation as it developed under the expansionist pressure on trade created by years of cheap interest rates policy, one must be fully aware of the fact that the termination of this policy will make visible the havoc it has spread. The incorrigible inflationists will cry out against alleged deflation and will advertise again their patent medicine, inflation, rebaptizing it re-deflation. What generates the evils is the expansionist policy. Its termination only makes the evils visible. This termination must at any rate come sooner or later, and the later it comes, the more severe are the damages which the artificial boom has caused. As things are now, after a long period of artificially low interest rates, the question is not how to avoid the hardships of the process of recovery altogether, but how to reduce them to a minimum. If one does not terminate the expansionist policy in time by a return to balanced budgets, by abstaining from government borrowing from the commercial banks and by letting the market determine the height of interest rates, one chooses the German way of 1923. The Bank of England hopes to avoid all this by manipulating people’s expectations about inflation and GDP growth. I don’t think it can be done – too many commentators can see through it. Nevertheless, they are going to give it a try. The best that can be said for it in the context of the German experience which Mises predicted and lived through is that at least if coming events are well understood, contemporary errors may at last produce the paradigm shift in economic thought necessary to put us on a more just and moral economic path. This post originally appeared on www.stevebaker.info. Next they will de-value the kilogram and pound in weight, then shorten the metre and foot until they weigh and measure virtually nothing. However, money will be able to buy lots of them even though they weigh and measure nothing whilst complimenting ourselves on our astuteness and smirking at our cunning purchase at the expense of others…. The examples of 1923 and 1946 are not relevant in the 21st century. Central bankers back then didn’t have PhDs. They probably didn’t even have beards. This time is different. Indeed, “contemporary errors may at last produce the paradigm shift in economic thought necessary to put us on a more just and moral economic path”. However, that path will be but an updated combination of the road the Donner Party blazed through the Valley of Death. (http://en.wikipedia.org/wiki/Donner_Party#.22The_Forlorn_Hope.22) It will make the culmination of the Roman Siege of Jerusalem (70 A.D.) seem like a church picnic in comparison. Of that the Jewish historian, Josephus (who was there) wrote, “And truly, the very view itself was a melancholy thing; for those places which were adorned with trees and pleasant gardens, were now become desolate country every way, and its trees were all cut down.” (http://en.wikipedia.org/wiki/Siege_of_Jerusalem_%2870%29#Destruction_of_Jerusalem) Yep, when the shyster promises hope and change, while his result will be short on hope, the change will be painfully transformative. Sadly, it won’t merely be the stones of the Temple Mount’s Western Wall scattered in the streets, but the entirety of Western Civilization. Von Mises clearly inhabits la-la land, as do many of his followers in 2013: including Steve Baker. In particular, Von Mises claims that the only reason people continue to use paper money is that “due simply to the fact that the belief generally prevails that its progressive depreciation will soon stop”. Well now, the Pound Sterling, US dollar and virtually every other currency has steadily and “progressively depreciated” since WWII and before. Now that’s long enough for the average citizen to have got the message that the depreciation is not going to stop. Even more hilarious: almost every government and central bank has EXPLICITLY stated that they are aiming for about 2% inflation. Yet I see no sign that anyone is giving up the use of that paper money. People continue to use £20 notes in my local high street. Anyone out there seen people using lumps of gold or cowrie shells to do their shopping at their local Sainsburys? I think that you are dead right when you say that the evidence suggests that a depreciating currnecy has been tenable for the last 50 years. The reason that savers have been willing to put up with a growth in the supply of money over the last 50 years though is really because they have been able to access a real return for good portions of this time. i.e. if the interest rate is higher than the rate of inflation then we grumble but put up with it. The ‘depreciation’ of the pound so frequently cited by Austrian economists does not consider the compounded return that these pounds would have accrued at the risk-free rate if deposited in the banking system. If one does this, then the rate of depreciation of this paper money is much less than is always shown. The compound rate of inflation the same period is 340% (if you believe the numbers)! The change in the gold price over the same period has been from £119/oz to the current £838/oz, which is a return of 600%. This is pre-holding costs for gold. Hence, one can see that although the quantity of paper money has expanded and although there has been lots of inflation, it has not been an unreasonable thing to do to have had one’s money in the bank over this period. The danger of the paper money standard is that the government is in control and can use paper money to fund its programmes. Hence, it is a statist system which is constantly open to abuse. Governments will tend to print to fund their own programmes as much as they can so long as they don’t lose the trust of savers. Hence, it feeds the public sector at the expense of the private. It gives to current generations and takes from future ones. This is undesirable from the point of view of growth and from the point of view of libertarians for political reasons (with which I happen to agree with). However, it is not necessarily unsustainable as Ralph points out. Those who think otherwise should do as he says and examine the evidence of the last 50 years. The current interest rates of 0.5%, with inflation running significantly higher appear to be unsustainable – I would agree with this. I would also agree that the banking system is dangerously leveraged, that policies of maintain low rates is unfair and also that central banking/fractional reserving tends to become rigged in the favour of speculators over time, which is unfairly redistributive and therefore immoral. However, much as many of us would prefer to return to a gold standard, I think that it is a bit disingenuous to point to money-supply growth/paper currency depreciation as evidence of unsustainability given the evidence against this argument. Savers have been allowed a real return on average over the past 34 years. Apologies – the numbers above were slightly wrong. I got some of the years incorrect. However, the point is the same – putting ones money in the bank, compounded has been okay if measured since 1975. Would you care to explain what you believe is the real reason that the Germans are no longer using the Papiermark, Ralph Musgrave?